From the Library main page, click on freegal either from the header dropdown or through the eResources page. You will be directed to the site, which should have the Public Library logo at the top left. On the right of the page is a "Login" button. If you are not in a library branch, you can go to the freegal website and provide location information to find the Public Library Albuquerque Bernalillo County. To increase usability, download the free iOS app or Android app. There's also an app for Kindle Fire. Depending on the model you have, may need to select "download from unknown sources" in the Settings menu. 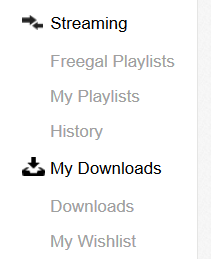 Freegal users have access to unlimited daily streaming and 5 downloads per week. At the very top of the webpage, you will see the amount of time you have left for streaming for the day and the number of downloads allowed based on previous use of the account. Download count resets every Monday at 12:01 EST. Note that videos are considered premium content and will use two of your downloads. Search can be done either by Keyword or can be limited to Artist, Song, Album, or Video through the dropdown menu. There is an advanced search option above the Search box, which will allow you to use OR and AND operators as well as quotations “ ” to find a specific phrase. Also, you may limit a word from being included in search by using the minus - key. In the menu on the left of the screen, there are links for freegal Playlists, My Playlists, Now Streaming, and Listening History. Popular playlists and downloads can be viewed through the Most Popular heading at the top of the webpage. Songs that you have downloaded in the last two weeks will appear under the My Downloads link. The top header contains links to Featured albums, quick browsing of the Top 10 recent downloads by the community, and the Top 10 recent downloads of all the Freegal users in your country are in the top header of the main box. In the upper-right corner you will see your weekly download allocation and the number that you have used in the current week. The search icon is in the upper right side as well. The play button will stream and the icon with the downward pointing arrow indicates a download. In the body of the page you will see several buttons. My Music: My Music is where all your songs are stored. Once you download a song, this is where it goes. Recent: Contains a list of all songs that you have streamed on a particular day. My Music section may be grouped in the More page with My Music Videos and Settings. The Recent page contains a list of all songs that you have streamed that particular day. On the left of the main page, detail about playlists, history, downloads, etc. are listed. The file just opens without saving to my computer. How do I save it? When downloading, you will normally be given the option to “Open” or “Save” the file. Select “Save” to place the file in downloads folder (or the folder selected for downloaded items). Click to open the file and it should play with your default music player. To play with Windows Media Player, you can drag and drop the file into the program window or optionally, import it through the File menu. To place on an MP3 or other device, simply move the file or queue as you normally would. My device crashed and files were erased. Can Freegal restore songs to my library? Because of licensing agreements, Freegal cannot restore music libraries that have been lost. As with other files, Freegal recommends backing them up on an alternative disk. For example, if you have your music library in iTunes on your computer, you could back up to iCloud so your music isn’t only on your computer. If you’re using iOS, you can also back up everything to iCloud. You could also use File Sharing in iTunes to sync the music on your iOS device with iTunes on your computer. For Android devices, you can backup files to a cloud service, such as Dropbox, to your personal computer, or to an external hard drive. Again, once music is downloaded from the Freegal Music site, it is yours to keep and do with what you want. Backing up personal computing devices is always recommended, and if you elect not to do this, Freegal cannot restore your music library. Some songs distributed to Freegal have download rights, from the artist’s label, that designate they are only available for download with the download of the entire album on which they appear. Freegal Music allows you to download only individual songs and not entire albums, therefore we cannot offer these songs for download. My app does not show me Recent Downloads. What it one fails and I want to check its status? In the mobile apps there is no Recent Downloads section (but downloads through the app will still be present if user logs in through a desktop or laptop). If a download fails for lack of cell service or other issue, the next time that the app is opened a dialog will ask to resume any failed download. “My Wishlist” is a tool that lets you store desired downloads if you have used up your allotted downloads (3 maximum per week). 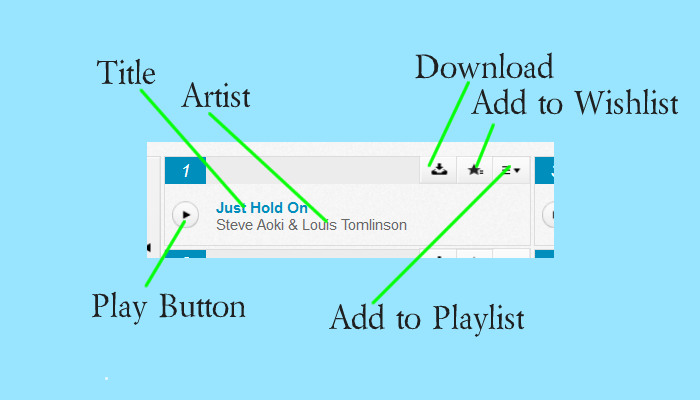 Browse the site and add by pressing the + button on the right-hand side of the song bar. A popup will allow you to add to wishlist. When you have available downloads the following week, you can come back to the list and execute the download. Click on "My Playlists" under "Streaming" on the left side. Click on "Create and Store Playlists". At the top center, click on the "+" symbol next to "Saved Playlists". Name your playlist (ex. “The Boss") and describe it (ex. "Bruce"). In that box, click on "Create New Playlist" and your playlist is ready to add music. Click on the "Home" page and start looking for music to add. To add an album, move your cursor over an album cover and a =+ will appear. Click on that, and then add to your chosen playlist option. Apple: Plug the Android device (version 2.3 or higher) into the USB adapter and select the option (on the Android device) to mount as a disk. From this point you can find the device through Finder, open the device, then open the folder titled “Freegal Music”. Inside this folder will be your patron barcode folder. Drag this folder to your desktop. Once it copies, you can drag it straight into iTunes and iTunes will sort your music. PC: On a PC, once you connect your device it should be detected automatically and the computer will prompt to install software if not already installed. For troubleshooting on a specific device please check the Android forums (for example http://www.xda-developers.com/). If not, open Computer folder to see your device. Choose to browse Internal Storage on that device, then open the folder titled “Freegal Music”. Inside this folder, you will see another folder labeled with your patron card number. This folder contains the songs and videos that you’ve downloaded through the Freegal Music app. Simply drag this folder to your desktop, and once the transfer is complete you can then move the songs and videos wherever you’d like on your computer. Android 4.0 or newer: Download the Android File Transfer software through this Link. Simple and easy to use, Freegal is an online music service that provides streaming and downloadable music as well as thousands of music videos. Keep your music organized with playlists, download history, and see what others are listening to. With a handy online music player and no local software, your library card is a ticket to great music and music videos! Who pays artists for the music? All music on freegal is licensed through agreements with Artist label or the recording company that owns the rights to the music. As freegal puts it, the service is underwritten by your local library! Downloading is capturing and keeping the file on a permanent basis. Streaming is accessing the file on a temporary basis, while connected to the internet. Streaming gives you access to more music. Your daily streaming limit is posted in the upper-right corner of the home page. The music you access via the freegal site is for non-commercial purposes only. It comes with a license for personal use only. This means that you cannot duplicate it for others, or play it in public, other than for the intended enjoyment of a normal circle of family or friends. Are there Digital Rights Management (DRM) restrictions on downloaded files? No. Songs downloaded through freegal are free of restrictions imposed by DRM. Thus, you can move the file around, transfer to other computers or devices, or even burn to a CD. Remember that copyright restrictions do apply; more information about copyright is available by calling or visiting any of the Public Library branch locations.